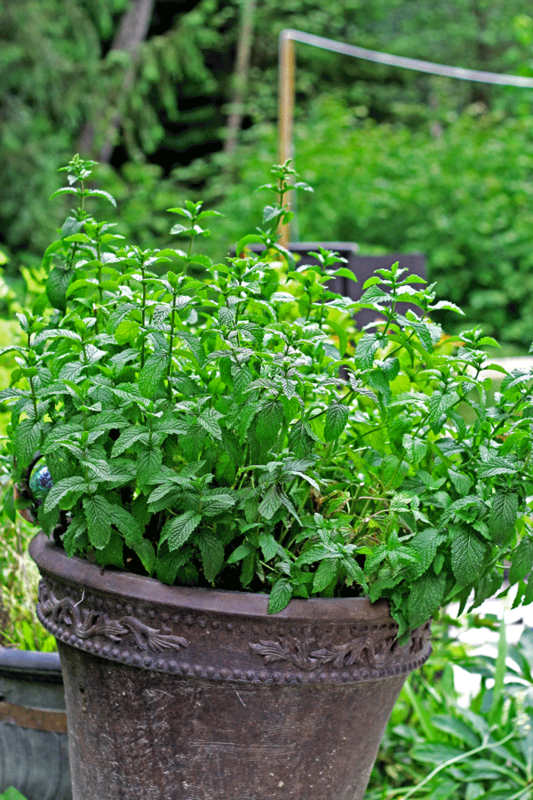 Plus, did you know its National Mojito day? It is! Mark it in your calendar. Just one more reason to try this juicy drink. Have I mentioned before that Debbie and I love Mojitos? Maybe once or twice… How can you not? The mint makes the drink taste so fresh and when you add the fruit to it with a hint of sweetness and top it all off with bubbles, it doesn’t get much better. Except maybe when you drink these in the pool, under the hot sun, in the summer, with friends and family, with no work the next day. Or in Vegas. Or in Cuba. You get my drift? We have these massive floaties that we have a lot of fun on in the summer! We call them Capri Party Island 1 and Party Island 2. Capri Party Island is on its last life having been patched many many times, due largely to us using it to float down the Vedder River. The first bit of the river run is not very relaxing as there are a bunch of turns in the river and the water gets going pretty fast at these turns. We had 10 people on Party Island and we all had to take turns jumping in and using our bodies to shield Party Island from the jagged rocks on the edge of the river or big branches poking up out of the water. All of us except Debbie that is… She just floats and looks pretty. Although at one point, we ended up running into some trees on the bank of the river with fish hooks hanging out of them and Debbie got one stuck in her back which caused a mild panic. As I’m sure you can imagine…. Its still fun though. We keep doing this so it must be, lol. The point of my story is that Debbie and I decided to have mojitos on one of these river floats. Because, as I mentioned, we love them. Not thinking of how difficult it might be to muddle mint and lime and mix the dang drink as we floated through the quick parts of the river. Needless to say, we didn’t do much muddling lol, and it took both of us every time, but we made our mojitos! Oh man, thinking about this and other stories of floating down the river is making me laugh out loud. Things can sometimes get a bit messy after being on a Party Island for 3 hours straight. I would tell you stories, but I would probably get in trouble. 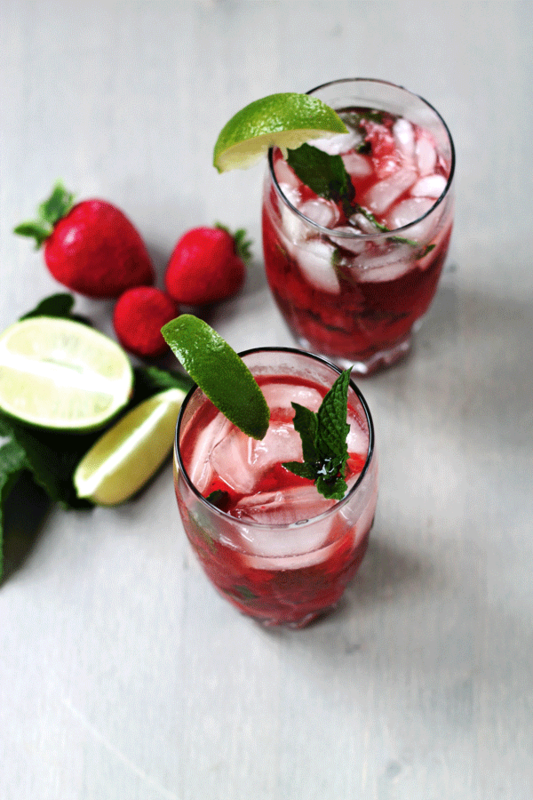 That story didn’t have anything to do with strawberries, but its just a testament to how much we love mojitos. 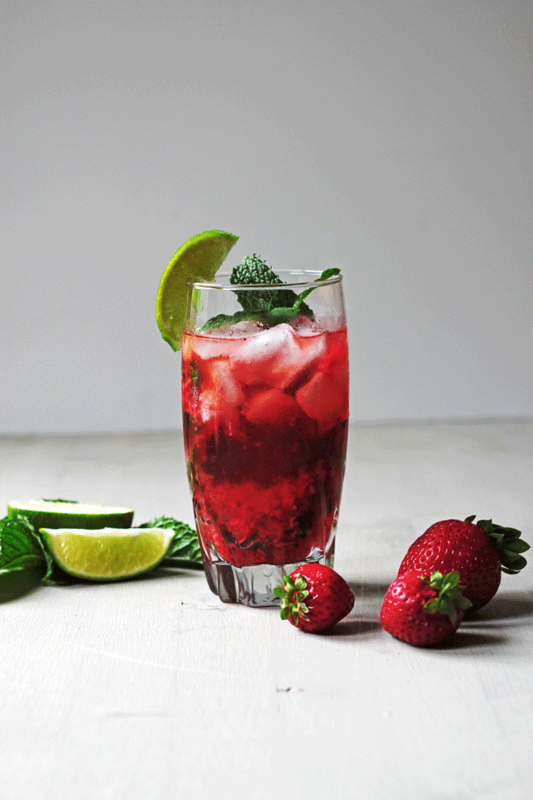 Maybe next time we will make a strawberry mojito. 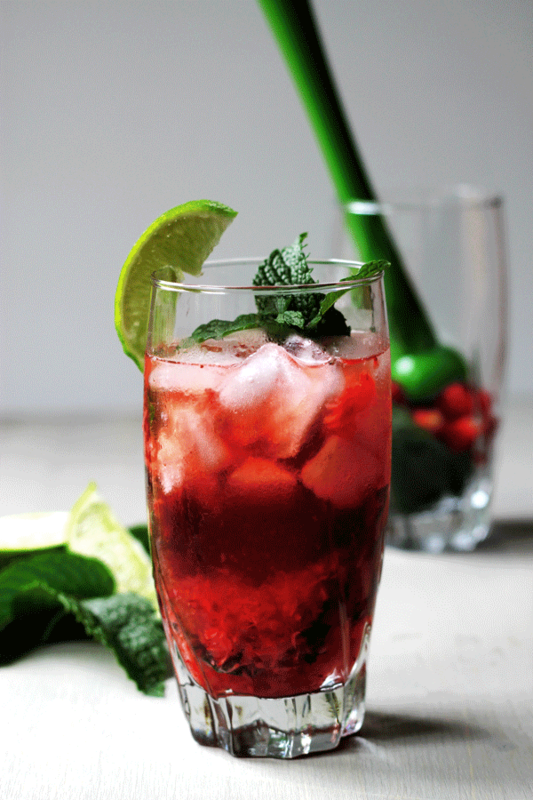 Strawberries and mint are a fantastic flavor combination. Especially when the strawberries are so sweet like they are right now. They almost taste as if they have sprinkle of sugar on them. This drink still needs a tiny bit of help from agave nectar or simple syrup but not nearly as much as normal. We like to use agave nectar or honey just because we feel like its better than refined sugar and its pretty easy when you can just pour it in rather than having to make a simple syrup. You had better make a pitcher. 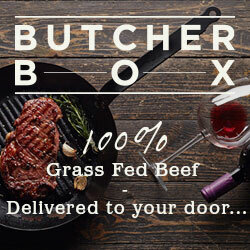 You are going to love these! If you want to see some other twists on the original, check out our the Champagne Grapefruit Pineapple Mojito or Blood Orange Mojito. 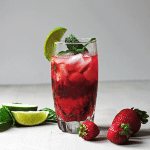 Place the mint, rum, sliced strawberries, agave nectar or honey and lime in a tall glass. 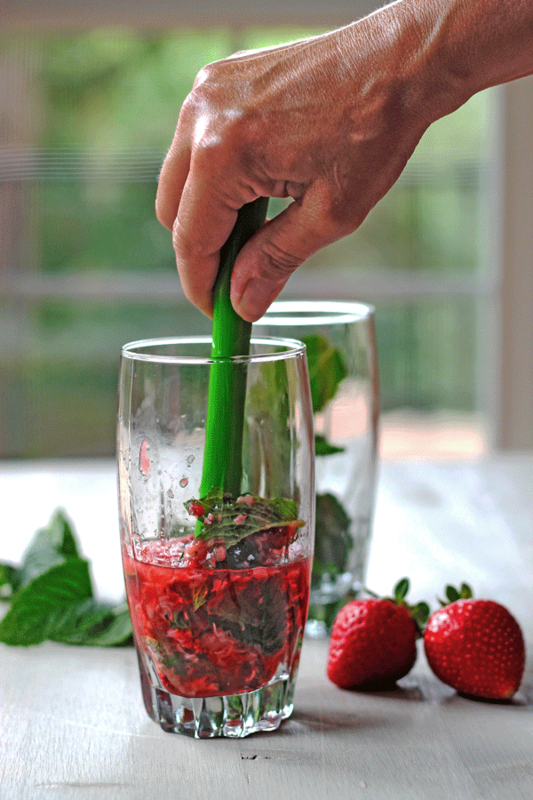 With a muddler, smash all that around a bit till the strawberries and mint are broken up. Fill the glass up with ice first and then top it all off with club soda. 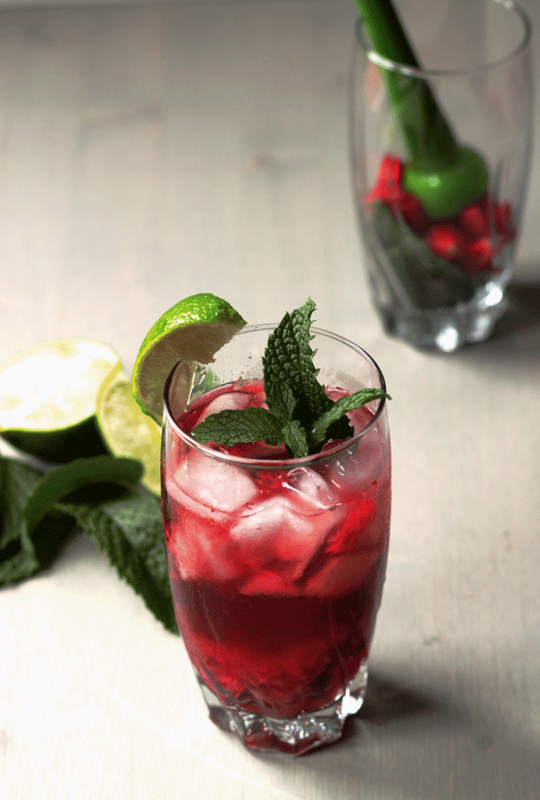 Garnish with a piece of mint and a lime and sip away! This looks amazing and so refreshing! yum! !